Thomas was quick to be reminded who runs Capitol Hill. A global war was declared against her. She had to resign and to apologise. However, her brief yet transparently clear solution is sound and should be elaborated upon. It is an obvious fact that the Israelis do not belong to the region. The Jewish claim for Zion i.e. Palestine is beyond pathetic. It is in fact as ridiculous as a bunch of Italian settlers invading London's Piccadilly Circus claiming their right to return to a land once occupied by their Roman forefathers. Obviously Italians would not get away with it, Zionists, on the other hand, have managed to fool the nations for more than a while. 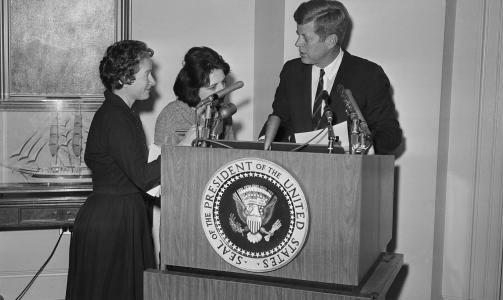 Unlike our Western politicians and Media, Helen Thomas was not impressed by the Zionist argument. Let’s try to understand what she is saying. She suggests primarily that Jews don’t belong to Palestine and Palestine certainly doesn’t belong to the Jews. She also argues that the home for Jews is somewhere else. Thomas suggested for instance that Jews should go to Germany. Surely this is not such a rude idea considering the love Germany pours on Israel. We shouldn’t also forget that the Israeli nuclear submarines that have been on their way to the Gulf (according to The Times), were given to Israel by Germany as a ‘present’ at the time that Israel flattened Lebanon (2006). If Angela Merkel is sincere, she should welcome the Israelis to return to her country and save the world from another world conflict. As it happens, most Western leaders support the Two State Solution, they believe that such a solution is fair and ethical. I wonder what is so ethical about it, the Two State Solution doesn’t address the Palestinian Cause. It largely ignores the Palestinian Right of Return to their land, homes, villages, fields and orchards. It accepts the outrageous circumstances in which millions of Palestinian refugees will be left dispossessed forever. Most humanists seem to support the One State Solution, they are convinced that such a solution is fair and ethical. Again, I am rather perplexed here. As much as we accept that sharing the land is reasonable and ethical, it is completely foreign to Jewish ideology and Zionism in particular. Early Zionist immigrants were more than welcome to share the land with the Palestinian indigenous population. But they had a completely different plan in mind, they wanted a ‘Jews only State’. They eventually ethnically cleansed the Palestinians (1948), Those who managed to cling to the land were eventually locked behind walls and barbed wire. The One State Solution dismisses the Jewish ideology. As much as I myself tend to support the One State Solution, I am fully aware of the fact that such a solution may become possible only when the Israeli Jewish population gives up its supremacist ideology. Needless to say that when this happens, the Jews in Palestine would become Palestinian Jews: ordinary people of Jewish ethnic origin who happen to live on Palestinian land. Those who are repulsed by Helen Thomas’ resolution, blame her for being discriminatory towards Jews. The truth of the matter is that Thomas’ suggestion is not at all different or more discriminatory than the notorious Two State Solution. While Thomas suggests that millions of Jews would peacefully go back to their true home, the Two State Resolution suggests that millions of Palestinian refugees would be left with no home whatsoever. Clearly, the Israeli State mentions again and again that it would never allow Palestinian refugees to return to their land. Considering the latest Israeli barbarian military operations, bearing in mind the disastrous starvation in Gaza, learning about the serious threat to world peace imposed by repeated nuclear threats made by Israel against its neighboring States and Iran in particular, we should move the discourse one step further. We better look at the Helen Thomas’ solution. Seemingly, the Rabbi who assaulted Helen Thomas, is not impressed by Thomas’ solution. He was concerned about six million Jews who perished in Europe. Someone should remind the Rabbi that the European Judeocide has nothing to do with Palestine or the Palestinians. However, his own behaviour towards Thomas together with the Israeli repellent murderous behaviour in the high seas, in Palestine, and the Jewish lobbies around the world, all contribute together to a necessary revision of the notion of ‘Jewish suffering’ in history. At the end of the day, our vision of the past is constantly shaped by our present understandings. Like the rest of humanity, Old Helen Thomas is tired of Jewish power and Israeli barbarism, she touched the nerve exactly where it hurts by saying the plain truth. “Get the hell out of Palestine”. Truth, it seems, echoes ethics and reason.